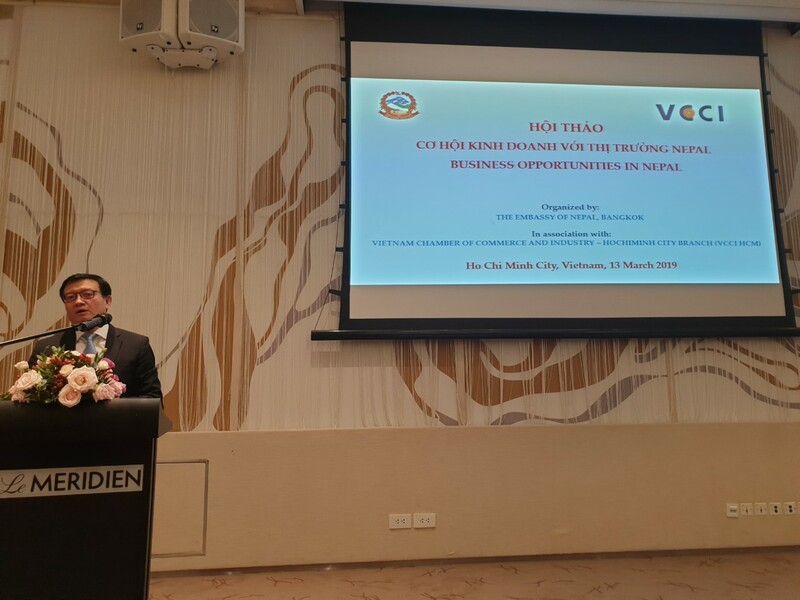 The Embassy of Nepal, Bangkok, in association with Vietnam Chamber of Commerce and Industries (VCCI) Ho Chi Minh Branch (HCM),organized a Business/Tourism/Trekking promotion programme in Ho Chi Minh City of Vietnam on 13 March 2019. Mr. Nguyen The Hung, Deputy Director General of VCCI-Ho Chi Minh Branch, Mr. Nguyen Van Tuan, Director of VCCI-HCM,other officials of VCCI were present during the programme. 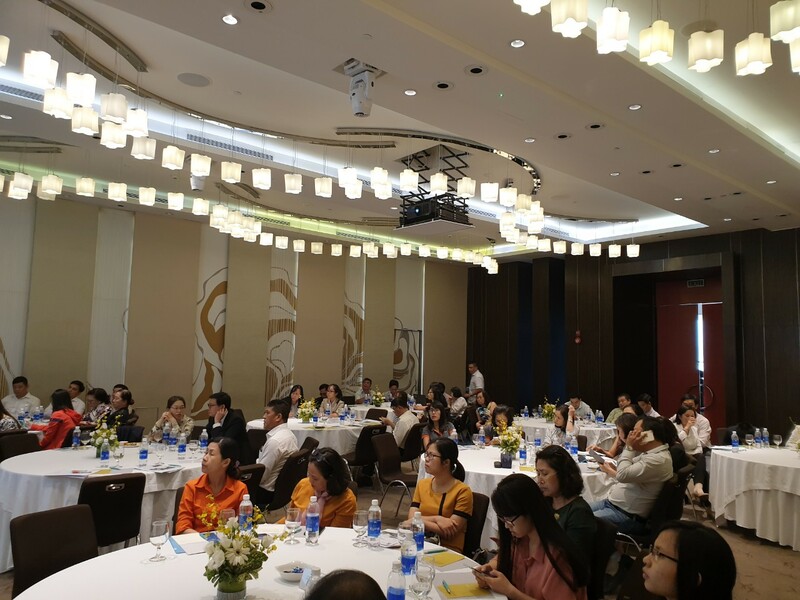 A large number of participants, including representatives from Ho Chi Minh City Department of Industry and Trade, business entrepreneurs, travel/tour operators, media persons and representatives of the Nepalese community in Ho Chi Minh City participated in the programme. Welcoming the participants, Mr. Nguyen The Hung, Deputy Director General of VCCI-Ho Chi Minh Branchsaid Vietnam and Nepal have huge potentials for cooperation in various sectors, especially tourism and business. He spoke about Nepal’s tourism, and said that only about 7,000 Vietnamese tourists traveled to Nepal, most of them choosing spiritual tourism and eco-tourism’. He urged all travel/tour operators in Vietnam to cooperate with Nepali travel/tour operators to encourage Vietnamese people to visit Nepal, mainly Lumbini, the birth place of Lord Buddha. Counsellor/DCMMr. Janga Bahadur Gurung, in his brief remarks spoke about the bilateral relations between Nepal and Vietnam, the upcoming ‘Nepal Investment Summit’ to be held on 29-30 March 2019 in Kathmandu and also, a Crafts and Culture Festival being organized in Lalitpur from 27 to 31 March 2019. After that, he made presentation on business opportunities in Nepal. He gave a detailed presentation on various areas on which foreign investors can start businesses in Nepal and also mentioned the various facilities & incentives for investors. He also said the Government of Nepal is now in the process of amendments of several Acts and Rules related to foreign investment, with an aim to promote foreign investment and build investment-friendly environment. Mrs. Pratigy Rai, Second Secretary, made a detailed presentation on Nepal’s tourism. In her presentation, she highlighted tourism attractions and opportunities in Nepal, focusing on Lumbini, the birth place of Lord Buddha and trekking opportunities in Nepal. She also urged the audience to visit Nepal for trekking to see the diverse natural & cultural attraction and to have a lifetime experience of the serenity of nature, breath-taking panoramic landscape, the Himalayas, green forests, and waterfalls & lakes. The programme was given wide publicity by Vietnamese media the next day. The programme is believed to have contributed to givingfurther publicity about Nepal in Vietnam, thereby promoting Nepal’s business/investment and tourism. Copyright © 2019 Embassy of Nepal – Bangkok, Thailand . All Rights Reserved. MoFA,Nepal by IT Experts Solution PVt. Ltd.